Now children can watch Santa Come To Life in these beautifully illustrated books from Little Hippo Books. Visions of sugarplums and jolly St. Nicholas are brought to life when you and your little one enter this timeless tale of Christmas Eve! 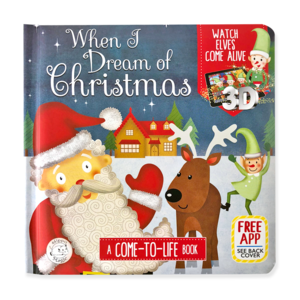 Children will adore watching this holly jolly bedtime story brought to life before their very eyes with a bit of digital magic, which puts a spirited modern spin on a festive tradition. Download the FREE Hippo Magic® App to your smart device, then scan the Hippo Magic symbol and dash away with Dancer, Prance, Vixen and Santa himself! 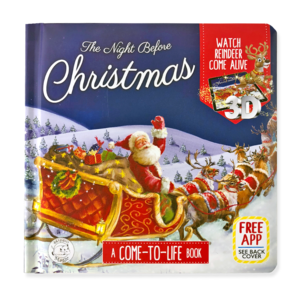 The joyful spirit of the holiday season is brought to life with this interactive storybook. Visit the elves at Santa’s workshop, play with reindeer and experience all of the most magical parts of Christmastime. You and your little elves can build toys and wrap gifts, have a snowball fight with Santa and the elves, and then cozy up to the fireplace with a cup of hot cocoa and marshmallows in this fun-filled festive tale. Download the FREE Hippo Magic® App to your smart device, then scan the Hippo Magic symbol to make your little one’s Christmas dreams come true. This Christmas classic is a family favorite. Read along and help Santa guide his reindeer through the sky by feeding them magic berries. These books retail for $9.99 each. Free shipping when you purchase 2 or more books! Purchase by visiting Little Hippo Books. Disclosure: I am posting this as an affiliate of Little Hippo Books. This post contains affiliate links.